COIR is hosting a Christmas Gala & BBQ for friends & family on Saturday 24th Nov from 6.30pm. The gala will showcase our SFSC skaters & we invite our members to participate on the night! If you would like to skate in the gala, please complete the 2018 Christmas Gala Rego Form and return to COIR by 5pm on 22nd Nov. With the lead up to nationals, it is the perfect opportunity to showcase your program to the public. Please note there is only one hour allocated & spots will fill up quickly so don’t delay. 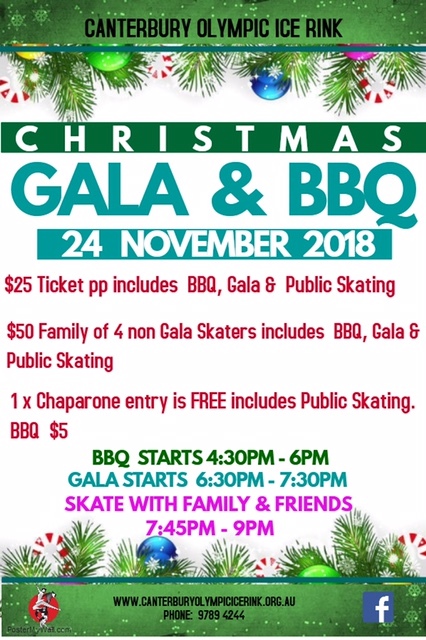 Also note skaters will receive free sausage roll & drink, as well as free entry and public skating after the gala for themselves and a chaperone. The Gala & BBQ poster is available below and provides more information on the event. The gala will commence at 6.30pm followed by a public skating session at 7.45-9.00pm. It will be a wonderful evening to celebrate our skaters & enjoy with family and friends!